On the road to legend, we never lose proud, power and passion. We pave our ways to victory, striving for one game, sharing one belief, bonding as one team. Now, just one more step, we are closer to the edge. Choose the most-recommended gaming pc and gaming laptop to ESL Gaming. MSI has got your back! MSI GE63 Raider RGB laptops as the official broadcast laptop provider for ESL Pro League 2018, with the 12 zones of the RGB lights design at top cover on both sides of the Mystic Lights, the backlit accompanied with 24 Million different shinning modes, users, broadcaster and analyst desks could show more in-game real-time interactions plus more fancy and professional gaming skills related to the lights from top cover and keyboard backlit! The Infinite X is built for gamers with never-ending desire to game and want endless possibilities to game the way they want. This desktop is delivering the best gaming performance by equipping MSI’s renowned graphics cards to give gamers more in-game advantage. To keep the powerful system cool, the Infinite A has MSI’s exclusive Silent Storm Cooling 3 Pro thermal design, making its cooling unmatched efficiency and as quiet as an assassin. The MSI GAMING Graphics Card comes equipped with the full force of the TWIN FROZR VI cooler, allowing for higher core and memory clock speeds for increased performance in games. The exclusive and patented MSI TORX 2.0 Fan technology uses the power of teamwork to allow the TWIN FROZR VI to achieve new levels of cool. 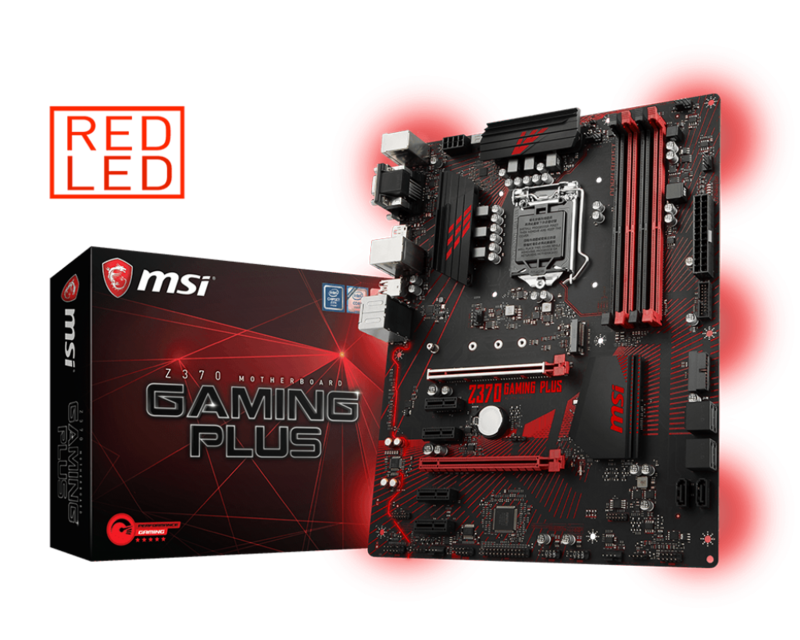 Satisfying gamers with what they really need, the Z370 GAMING PLUS motherboard is equipped with all the crucial gaming elements. Rewarded your ears by Audio Boost for the most immersive gaming experience; powered by Intel Optane Memory solution, accelerating your system transfer speeds on an affordable and large storage capacity; optimized by Intel® LAN automatically classifies and prioritizes the latency-sensitive applications for online games. Red GAMING DNA lives on! Never defeat by the struggle, you just need the MSI GAMING HARDWARE to support. ESL plays the game with MSI.